Everyone knows the BAWARCHI's Saroj Kering. She has been part of the immensely popular website Bawarchi.com (now Food.Sify.com) since its inception in 1995. Saroj started writing a recipe a day on Bawarchi.com and slowly her fan club grew with viewers from all from all over the world. Last year she set out to write and compile her very first cookbook "Festive Indian Recipes" We are proud to feature her as our celebrity Star Chef! Her brand new website has some very simple yet creative vegetarian recipes. Here is a "zhalak" of her interview with us. Congratulations Saroj & continued success!!! Read all about her. Here are the categories. Tell us how your interest in cooking started and at what age? I was interested in cooking from a very early age of twelve. I would love to make and put together my own lunch box for school. That was when I knew I was in my element when I was in the kitchen creating. What do you enjoy most about being recognized as gifted Indian culinary artist? What was - if ever your biggest setback? What have you done right that has made your career such a success and brought you recognition, media attention, and awards? What are the tools of the trade you use most? What are your favorite kitchen gadgets? Why? A sharp knife, an electric hand blender, a small coffee grinder for my masalas: all these gadgets can be made to multitask. What are some of the skills that help all cooks/chefs succeed? Do you taste your recipe before you serve it? Which cuisine do you enjoy the most? Which Indian festival inspires you to cook up a storm? And why? If there was one tip that you would like to share with our audience - what is your tip for home cooks? Cooking is far far easier than it seems, so don't get frazzled by complicated recipes and exotic names. Break it down to simple steps: the golden rule is one step one line. Find substitutes for what you cannot find, but don't give up. Also always start with simple basics and then move ahead, don't start of with exotic cuisine, if you do not know you basics. What are three of your all time favorite dishes / recipes? Idli sambar, Chaats and my very own version of au gratin. Please submit one of your favorite and easy recipe for our audience. Insert a clove at the center to hold all the folds together. Deep-fry in hot ghee on low till very light brown. Break khoya till coarse crumbs are formed. Mix cardamom and khoya into the cooled syrup. One hour before serving, immerse triangles in the syrup. 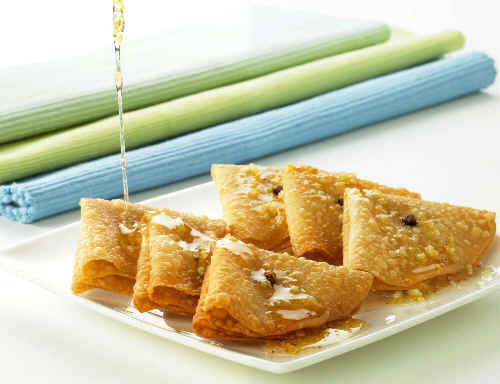 For serving, place a triangle in the bowl and pour a spoonful of syrup on top. Is there anything else you can tell us about yourself, your career, or the profession that would be interesting or helpful to others aspiring to enter and succeed as a chef? After almost 13 years of writing recipes on the net, I have now had the good fortune of coming out with a cookery book. 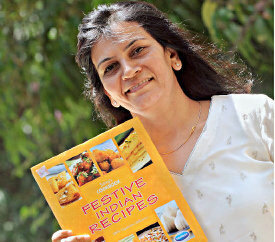 - Festive Indian Recipes published by Navneet Publications. So follow your dreams. The opportunities in today's world for culinary art are endless, if you're serious, nothing can stop you from succeeding. Everybody needs food! What advice can you give to busy working moms as far as cooking a nutritious meal is concerned? Here are a few good tips to remember. Plan sensibly, organize multitask and use time-saver techniques. Don't binge on takeaways and junk as a habit. 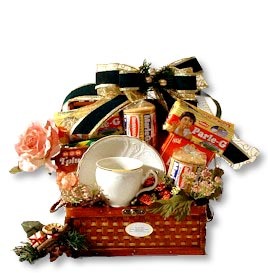 Make often required chutneys, pastes, etc. in larger quantities on weekends, and freeze. Do you encourage cooking for all – boys and girls and at what age should they get started? And why? We hope you enjoyed the interview. For more Star Chefs go here.